Used with air operated diaphragm actuated control valves. 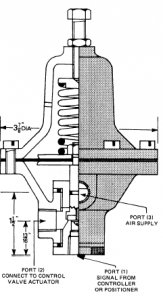 When the air supply drops below a predetermined value the Type R188 isolates the control valve actuator holding the control valve in its last position. The pressure at which the Type R188 operates can be sent by means of the spring adjusting screw. Two springs are available for maximum settings of 40 psig I2.7 barG) and 80 psig (5.4 barG). A mounting plate is available for mounting the Type R188 on diaphragm actuators using two of the flange bolts.